I enjoy celebrating special occasions as much as the next person but I also enjoy making ordinary days more memorable with simple unexpected gestures. To my son that may mean the smell of bacon from the downstairs kitchen when he gets up in the morning for school. Give that boy two slices of hickory smoked bacon and he is in “hog” heaven. Sorry, I couldn’t resist. Let him take an extra slice or two in his pocket to school and he is on cloud nine. I do this now because my mom did it for me. She used to put notes in my lunch box every day when I was in elementary school. She would have tea parties for us in the afternoons and whenever you needed cheering up, she always had some little trinket ready. The little things she did made such a difference in my life. I often find myself thinking of something she said or did and I use the idea with my own family. I’ve also been known to come up with my own surprises. Sometimes I warm up towels for my hubby and kids before they finish their shower or make sandwiches in funny shapes or whip out a long awaited DVD for family movie night. Some things I do make the family laugh. Other things I do embarrass them but I’m convinced they will thank me later. Regardless, I think every day should be made special and it doesn’t take something extravagant or expensive to make it so. It just takes love and attention. I learned that from my mom. One year, our wedding anniversary was on a Tuesday. I hadn’t planned much since we’d had a special meal on the previous Saturday but suddenly I felt God leading me to make this night special for our whole family. It was a day to celebrate and our kids needed to enjoy it as much as we did. It was an opportunity for a memory to be made. 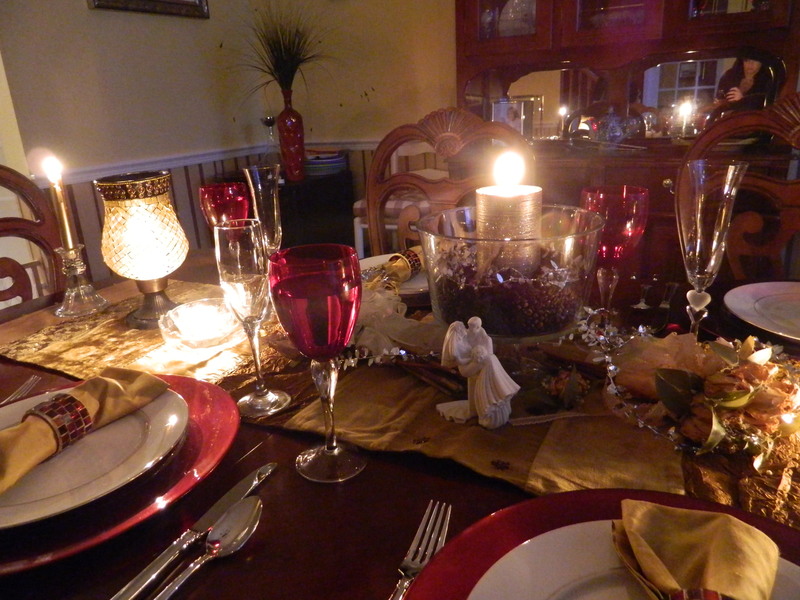 I decorated the large table in the formal dining room complete with the good china, silver, crystal and candles. I located various memorabilia from our wedding and included it in the table scape. I made my husband’s favorite meal and baked his favorite cake. When the kids arrived home I explained that we were celebrating a special day in the history of our family and we all dressed nicely for dinner. When my husband walked in the door, we surprised him and enjoyed good food, old stories and lots of laughs. As we were nearing the end of the meal, my son asked if we could do this every week! I used the opportunity to explain the importance of making memories with your family. Sometimes those memories include nice dinners with fancy china but sometimes those memories involve a simple note in your lunch box. Perhaps they will remember how anniversaries were made special and they’ll take those memories into their own relationships. If we as Godly parents don’t teach our children about love and family, the world will. My mom taught me that too. Regardless, of what we do to make the day special, it’s more important that we make the people we love feel special every day. Thank God for moms who take the time to teach us and put notes in our lunch boxes! Awesome!!!! I’m going to try harder to make ordinary days special days. Thanks for the reminder. How bitter sweet your blog makes me feel. I appreciated reading it as it was both encouraging, and also made me think of what I might have done better. Love reading your copy again!!!!!!!!!!!! Enjoyed your writing. Four grandchildren stayed here last night, played games, made ice-cream, and butter! But I didn’t wear a cape! 🙂 Now, they are all waking up. Got to go start the pancakes, so we can use our homemade butter. Beautiful, April! Congratulations on the blog. I am so glad you’re sharing your humor and wisdom. Our anniversary is in just a few weeks, and I will be stealing your idea.